Have you ever been watching a movie, or a TV show and thought to yourself, "I have seen this person somewhere before?" Perhaps you have, perhaps you've seen his or her, "celebrity look alike." Take a look at some of my favorites, I have compiled, just for your entertainment. CAUTION: This may blow your mind. Everyone who was born in the 80's or earlier remembers Kirstie Alley, primarily from the classic sitcom "Cheers" or at least from the now classic "Look who's talking" movies. If you were born a little "2000-and-late" then certainly you recognize the fergie related pun. While they aren't dead-ringers for each other, they definitely have close enough resemblance to make the top 5 celebrity look alikes. The primary reason these 2 celebrities only hit #4 on my list is because I wasn't entirely familiar with who Helen Christensen was, until I found this picture. 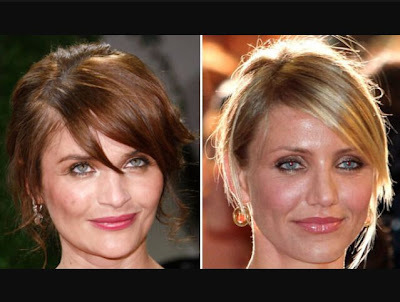 Everybody will recognize Cameron Diaz. From her break-out appearances in "The Mask" (starring Jim Carey) and "There's Something About Mary" (Starring Ben Stiller) to her more recent performances, such as the "Charlie's Angels" movies and "Bad Teacher". Whether you recognize them or not, there is no denying the eerie similarities between these two beauties. Natalie Portman. I just can't say enough about this woman. From her stunning beauty, to her contribution to many great movies. And what's even greater about this woman is she has a double. Keira Knightly. You might even recognize both of these women from the same film: Star Wars Episode I: The Phantom Menace. These celebs look so much alike, that Keira Knightley was chosen to play Sabé, the "decoy" hand-maiden, and look alike, to Natalie Portman's Queen Amidala. The picture says it all. Although Clint Eastwood might be a little old to take on such a role as Wolverine, he certainly could play the man's father. Lately Hollywood has done quite a few remakes of older films. 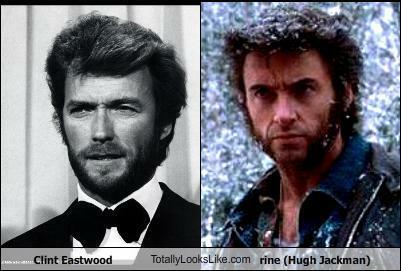 Were they to make a new "Dirty Harry" there is no doubt, Hugh Jackman would be the man for the part! Katy can sing and dance. Zooey can act, and sing. They're both beautiful and talented. And they could literally play twins. I didn't need to do any research to know well before writing this article, that these two women would be number one on my list of celebrity look alikes. So there you have it. My top 5 celebrities that look astoundingly like each other. Do you know of any others? Join in the fun and perhaps we'll make it a top ten next time around. Until then I hope you enjoyed this piece. Harry Potter Stars: What Are They Doing Now?